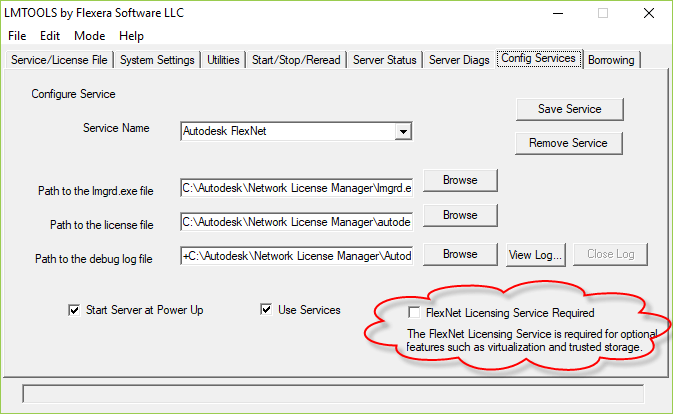 Autodesk Network License Manager 11.14.1.3 is now available and required when using Autodesk 2019 products like AutoCAD 2019. Download from Autodesk Knowledge Network. Starting with version v11.13.1.2, the default installation folder has changed to C:\Autodesk\Network License Manager. If you had any licensing service configured earlier with previous versions of the Network License Manager, you will have to re-configure them after installing the latest version of the NLM (starting with v11.14.1.3) due to a change in the default install location of the NLM binaries. In LMTOOLS on the System Settings tab the IPv4 and IPv6 addresses can be seen separately now. On the Config Services tab there is a new checkbox “FlexNet Licensing Service Required”. It is required for optional features such as virtualization and trusted storage. If you want to see current license status take a look at our freeware JTB FlexReport LT and if you want to monitor historic usage see our JTB FlexReport.